Should children be allowed screen time? Two writers from different camps, Tatler’s Alice Rose and Courtney Adamo of Babyccino Kids, debate one of modern parenting’s big questions. 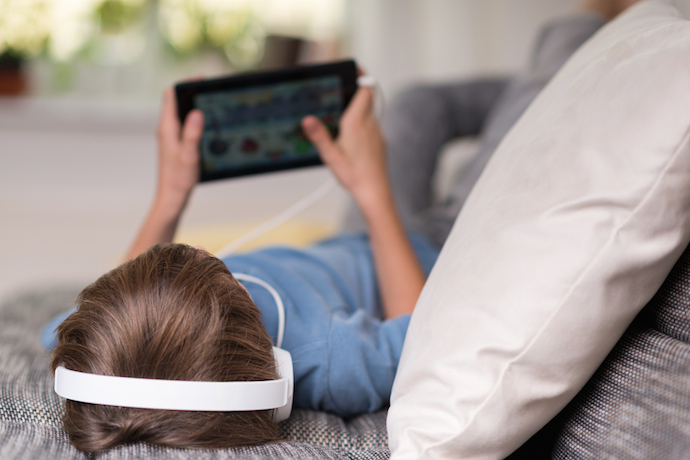 There are few things as contentious in modern parenting as how much screen time you allow. Some see no harm in letting children bathe in the glow of tablets, smartphones, TVs and computers during much-needed downtime, while others argue vehemently that screen time negatively affects behaviour as well as young, developing minds. Half-past four on a dark, wintery afternoon. Too early for bathtime, too late to go to the park. One end of the kitchen table is splattered with paint and glitter; the other splodged with nuggets of Playdough. My three boys (6, 4 and 2) have moved on to a hectic game building a ‘funfair’ with the sofa cushions. I’m trying to cook supper, reply to a work email, clear the debris. And then, naturally, WWIII breaks out – two boys in tears, one yelling at top volume in defensive indignation. I need Mary Poppins. In her absence, I invoke the 21st century equivalent: Peppa Pig. Reaching for the remote control means breaking a cardinal household rule – No Television on Weekdays Until After Supper. But the effect on the hooligans is instantaneous and extraordinary. By pressing play on Peppa, I press pause on the boys: tears dry up, quarrel is forgotten, instant calm. And then whoosh, the familiar slap of maternal guilt. Rubbish parenting. Chewing-gum-for-the-eyes. Of course, I should have calmed them down, sorted out the quarrel, made them tidy up the mess. It’s the same guilt-slap I feel when the two big boys play games on the iPad after lunch at weekends, and when I let my 2 year old play with my phone for 15 minutes so that I can make a work phone call… Yes, my sons’ screen time often coincides with my need to get stuff done. I work from home and don’t have help, which most of the time makes me the luckiest woman in the world – time with my children and some semblance of a career as well. Occasionally, when the wheels come off the work/life wagon, I resort to the Square Nanny. Mea culpa. More guilt. According to Baroness Susan Greenfield’s book Mind Change, by giving my boys access to screens, I’m messing with their neural pathways, limiting their attention spans, teaching them an inability to delay gratification, cutting off their empathy with the rest of the human race. And I’m probably responsible for the global decline in literacy standards as well. Hang on, Baroness Greenfield. My sons’ school is introducing iPads in reception. If they’ve decided that four year olds are going to benefit from limited access to educational games, why on earth should I be feeling guilty if they play similar games at home? When they’re exhausted after a long day at school, what’s wrong with half an hour’s decompression time in front of CBeebies? So let’s cut ourselves some slack on the guilt front and give ourselves credit for the hours of reading to and reading with. The answering of endless, ‘Why?’. The clearing-up of lagoons of paint, blizzards of glitter, Everests of Playdough; the nose-blowing, hand-holding, game-playing, just-once-more-ing. The hours we spend shivering in playgrounds or teaching them to ride bikes. As long as television, iPads and the rest are a small part of this much, much bigger picture, let’s silence the guilty voice in our heads and celebrate our membership of this miraculous digital age. Alice Rose is editor at large of Tatler Schools Guide. She has three boys aged 2, 4 and 6. Should children have screen time? Last year I had the pleasure of joining my 9 year old and his class on a school trip to the British Museum. It was my first experience as a parent helper in his class and I was really looking forward to it. The class had been studying Vikings as the term topic, and amazingly the museum was hosting a special exhibit on the very subject. I couldn’t help but think how lucky we are to live in London and have these museums on our doorstep, something I never experienced growing up on a farm. But sadly, what I remember most about this trip is my disappointment. Though the exhibit was fascinating, many of the children were playing games on phones and other devices throughout the museum. Though clearly not condoned, these kids were sneaking away to a quiet corner whenever their teachers turned their backs, eyes glued and thumbs pounding against a little screen. These children were so consumed by the device in their hands, so addicted to whatever game they were playing that they showed no interest in the once-in-a-lifetime exhibit before them. My heart sank a few notches that afternoon. I couldn’t help but question what the future holds for our children if screen time is replacing real-life experiences and interactions. I think most people would agree that a school field trip is not the place for electronics (they had been allowed, ostensibly, as cameras), but what about a meal in a restaurant, a journey on a train, or the commute to school? Devices are quietly filling the very few gaps in our life without stimulation. They are taking away our time to think, our time to daydream, our time to be bored, and our time to just be. We have a simple but straightforward philosophy on electronics in our home. We don’t forbid screens ­­– we just allow them sparingly, putting emphasis on time with family, friends and the physical world instead. We think electronics, including both TV and games, are addictive, and while they may be entertaining in the short term, they are often completely immersive and isolating, taking away from other more social, educational or imaginative activities. Though it can bring temporary tranquillity, the TV is never on in our home unless we’ve made a choice to sit down and watch a film, usually all together as a family. As my kids get older, I am increasingly reminded how fleeting their childhood is. The window for imaginative play is so short, not to mention so important, that we really feel it’s important to make the most of this precious time. When they ask to watch a movie or play on the iPad we usually tell them to go play – build towers, read books, draw pictures, make a mess in the garden or even just be bored. Along with necessity, I think boredom is the mother of invention, and I think it’s important to give kids the opportunity to be bored every once in a while. Naturally there are times when they are arguing and moaning and I’m about to pull my hair out, but I would rather they learn to work it out on their own than to quiet them down with a sedative dose of television. If I put a movie on every time things got a little out of hand, my kids would be watching a screen on a 24-hour loop. Again, I think back to my childhood on a farm. A downside being that we didn’t have amazing museums on our doorstep, but an advantage being we were too busy running around outside to have any interest in television. Cartoons and video games were simply not a part of our lives, and even as I grew older it was never something I missed. I suppose there is a part of me hoping that I can recreate this very play-based childhood for my own children. One where kids engage with the people and places around them, where entertainment comes from playing, learning comes from doing and boredom breeds imagination. Courtney Adamo is co-founder of Babyccino Kids. She has four children, two boys aged 9 and 7, and two girls, aged 5 and 2. I am always fascinated by the variety of opinions on this topic, and I enjoyed reading both of the perspectives presented here. I grew up in Florida in the 1980s. I don’t recall having any particular rules where television was concerned. But, looking back, it’s obvious that my parents and grandparents simply applied a common-sense approach to TV (and most everything else). They allowed us to watch television, but we were also often told to go play or to find something to do. We ran around outside, went swimming, rode bikes. When it rained, we played cards or checkers or read books. When we did watch TV, it was fine. When we didn’t, that was fine, too. Today, I have a four-year-old son and a two-year-old daughter. In our home, we have one small television that we keep in a cupboard. We allow our children to watch TV–mainly public television and classic films (think Mary Poppins, The Sound of Music, Annie). But here, as with most things, I rely on that same laid-back, common-sense approach to guide my parenting. The children spend the greater part of their time learning to play amongst themselves. They build block towers or race toy cars, they look at books or color. We take walks in our neighborhood or go on outings. As a parent, I aim to foster an environment rich with ingenuity and discovery via relatively sparse means. This goes a bit beyond the television argument, and sometimes it seems I am up against the world in this, but I believe that many people today plainly try to do too much. I don’t believe in the merits of multi-tasking and constant connectivity. I believe in focus. I believe downtime. I believe in creativity. I believe in mastering time, in self-knowledge, and in learning to set realistic expectations for oneself. I also believe in restrictions and in manners. I believe children should be able to sit properly at a table, accompany their parent into a shop, and ride in a car without requiring a distraction to behave. Like Courtney, I believe pure boredom is a natural catalyst for the imagination; the knowledge of its power seems all too fleeting. I believe in teaching children the beauty in living simply and contentedly within oneself and the natural environment. A few weeks ago, my four-year-old asked me what an iPad is. It was one of my proudest moments. Naturally, I use (and love) technology everyday. It’s an inevitable, and many times practical, part of modern life, but I believe it is to be approached, by adults and children, most discerningly. Isn’t this just one of the many dilemma’s we face now as parents? Screen time for the Playstation, Wii games, not Wii fit, and the TV is earned in our house. We consistently enforce this through sticker charts. Our son doesn’t have his own electronic device, he shares ours, our rationale is that soon, we will lose him to electronics, that time will come, but while we can go out for a meal and chatter, or do some colouring, or take something along to read, we will continue with that. I think if he was at home more, our circumstances dictate after school activities and after school club there would be more time to fill, and Im sure electronics would play a part in that. I’m a huge advocate of online learning, and coding for kids, how fantastic is that? We also like the stop frame animation apps. Digital media is a parenting tool, and we need to lead by example.